Oceanfront 2 Bedroom/2 Bath Condos in Paradise! Just a leisurely 90 minute drive from Miami Airport puts you in this Tropical Island Paradise. Choose from two units: one sixth-floor with panoramic ocean views, the other immaculate second-floor with oceanviews from your balcony. Both are quiet, clean, spacious two bedroom, two bath, child-friendly apartments that sleep six comfortably. This private complex on the ocean offers beautiful oceanfront heated pool and palm-tree lined tennis court. Grill your fresh "catch of the day" on the beach under tiki huts with barbecue grills, or dine in one of our fantastic local restaurants. There's even a fully-stocked kitchen and grocery store nearby to make your stay a tropical home away from home. Family-oriented fun and every water-sport imaginable are minutes away. Great dive adventures, offshore and back country fishing in crystal waters. Play "stingray tag" on a hobie cat, or bonefish from the property's beach. While not relaxing on the beach or by the pool you can daydream or stargaze on the ample, tiled balcony, which is accessible from the living room and both bedrooms. To preserve the highest quality for our guests, there are No Pets allowed and Smoking is confined to the balcony. We look forward to welcoming you, and to seeing you back for years to come! Spacious with ample seating for relaxing or dining. Beautiful tennis court on premises. While parts of the property are still in repairs from Hurricane Irma damage (the gym is a big one), the location and unit (607)were exactly what we were looking for. The view off the back deck is gorgeous. The kitchen is fully stocked and the space offered was what we needed for 4 adults. The owner, Bill, is quite responsive and easy to work with. Due to unexpected repairs, we were locked out twice, but property management helped us within a half hour each time. 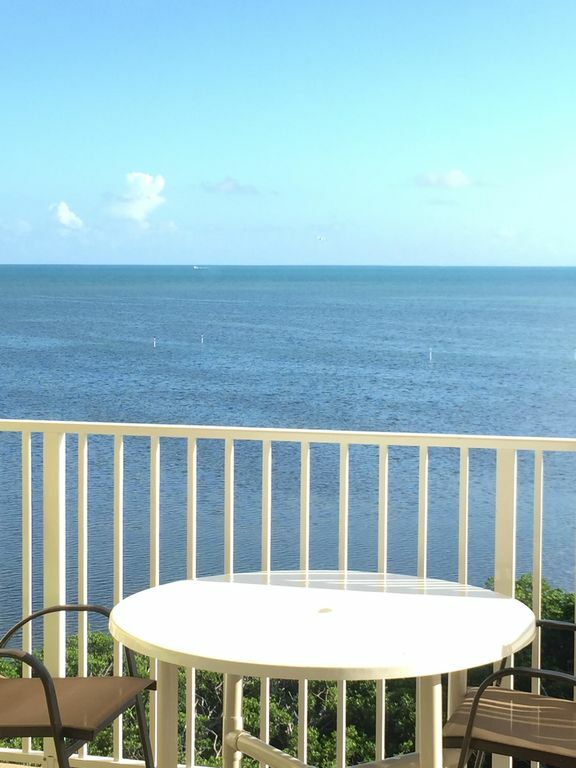 We recommend this rental for your next trip to the Keys.